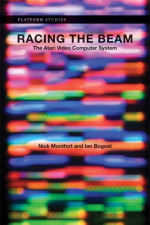 I just finished another great book the other day, entitled Racing the Beam: The Atari Video Computer System by Montfort and Bogost. It’s an inside book about some the development challenges and solutions when writing games for the Atari VCS. This is a unique machine and is often considered one of the most difficult machines for a programmer to cut their teeth on. With 128 bytes of RAM and an average ROM size of 2, 4, or 8K, you must fight tooth and nail of every byte used by your software. What lengths do some programmers go to skimp and save on bytes? Ever thought about using the same byte for both an opcode and a piece of data? Ever thought about using the opcodes and operands found in the code segment of your program as data, which gets fed a pseudo-random number generator or to produce a rendering effect because you didn’t have the spare space in ROM to place this stuff into the data segment? Well, neither did I until I read this text. Along with little gems like this, the book has a number of interesting tips and tricks into the how and why of software development for the Atari 2600. The book centres itself around the idea of a platform, and how the constraints and peculiarities of a system can affect how a game is presented. Game adaptation, especially when you’re trying to port software from one hardware architecture to another, is a very important topic when you’re trying to maintain the look or feel of a game. Sometimes, neither is possible and you’re forced to go your own road and come up with something completely different. A word of caution, though. This book will not teach you how to write software for the 2600 system. It is not a technical reference by any means, nor does it advertise itself as one. However, I would heartily recommend this title to anyone thinking about producing a game for that system, or those of us with an inner geek needing to be satisfied. I love the idea behind this series of “platform” books as I have often wished for such books to be written and have even contemplated writing one myself just to fill the void. One of the most useful parts of this book is the reference section which can lead you to all sorts of new and interesting articles, books, or projects. I do hope the next book contains a bit more technical detail while keeping thevarious bits of historical data and interesting character references which really helps to tie the why and the how of the topics together. I just finished a review of Racing The Beam – it was a fun book to read too. The bit about Yar’s revenge using the program itself to display the nutral zone was very cool. I liked though how the book talked as much about the environment (cultural, business practises) of the time as well as the technology. There’s some interesting trivia here too: like Atari setting up different companies to avoid regulations. If you liked that book, you make like one entitled Game Over: Press Start to Continue. While it doesn’t have the technical details found in Racing the Beam, it does have a lot of insight into the minds of the designers and business men who started this great company.